Space is a premium in Japan. Most Japanese are pretty taken aback by the size of ranch-style homes in North America, and it's quite common for any single - not just students - to rent a 1DK or an LDK until they are ready to start a family. Apartments are measured by the number of rooms and the number of tatami, traditional straw mats, that fit in each room. I lived in a 1K apartment, with the 1 meaning 1 room, and the K standing for kitchen. A 1DK would add a dining area; an L (LDK, 2LDK, etc) brings a living room into the picture. While I didn't have tatami in my apartment (a crushing disappointment - it was one of the uniquely Japanese things I was really looking forward to! ), my space measured about rokujo, or 6 mats' worth. (According to Wikipedia, 6 mats = 2.73 m × 3.64 m ≈ 9 ft × 12 ft.) I had a kitchen that was a hair larger than a kitchenette, as well as a toilet room and a bath room, separated, each with its own little door. At first glance I was Not Impressed. 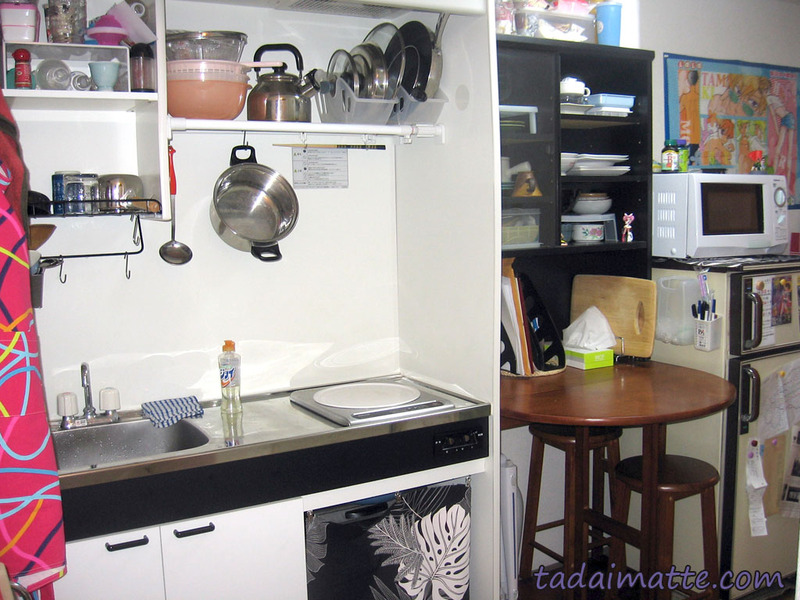 My predecessor had warned me that the apartment was on the small side, commenting that she had "enjoyed learning how to maximize [her] use of space." Still, in her photos (which I sadly no longer have - curse you Kodak Gallery Online!) it looked spacious enough! She used the oshiire, the closet for storing futon, as an in-wall desk and had hung poles inside for her clothes. She could just close off that space by shutting the door. 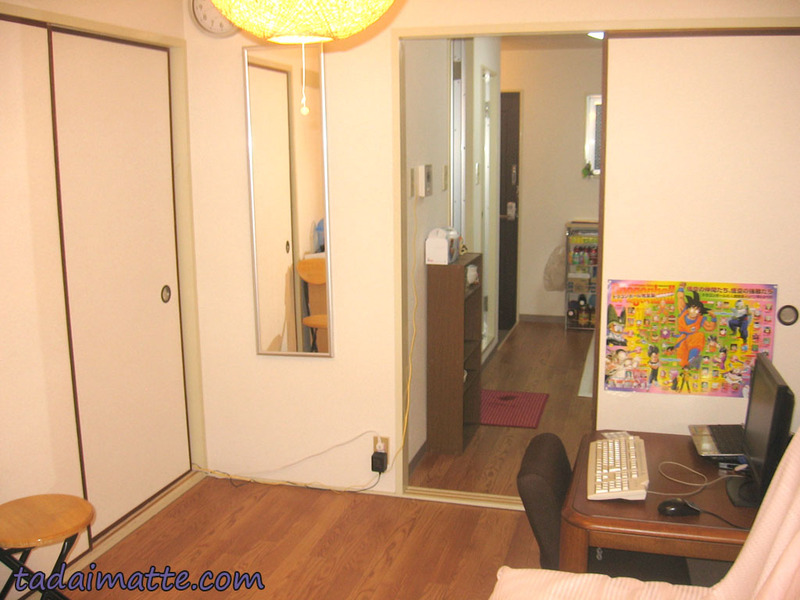 And honestly, looking at the circa-2007 photos above, it does look spacious. The problem is that I'm a packrat, and a packrat who wanted tons of adorable Japanese furniture and accessories. 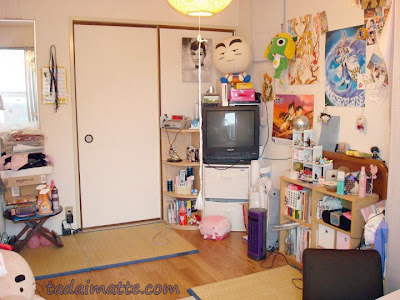 A pretty typical Japanese living room. I was prepared to roll with the whole thing, with a few conditions. The first thing I wanted was a kotatsu. Step off plane; buy kotatsu was my plan. That didn't work out - I arrived in August, after all. (I'll save the kotatsu for another, more seasonally-approproate post.) Instead I bought a Super Famicom, the Japanese original version of the Super Nintendo. I imagined myself amused for hours in my zenlike little apartment with a SuFami and the fifteen books I had carefully packed to make sure each of my suitcases was 70 lbs, no more, no less. In my apartment with no chairs and no bed, I was living the minimalist lifestyle. I congratulated myself on leaving most of my worldly possessions behind - one suitcase was clothes, one was omiyage and my computer monitor and keyboard, and my books. Fantastic. Beautiful. Who needed chairs, anyway!? ...I needed chairs. Sort of. Well, we had this wonderful department store nearby, Vivre, and they had these really cute legless chairs for sitting at kotatsu and other low tables. Then I found a legless lounging chair I thought would be perfect for those long SuFami afternoons. I biked to a department store 90 minutes away to buy this item, and blew a tire on my way home with a bunch of stuff strapped to my bike. Soon I had deemed the couch (it was a Western-style futon that folded into an uncomfortable bed) a waste of space and pushed it upright against the wall where it would stay out of my way. We nicknamed this the "death trap" after it fell on me one night as I slept. Sofas = wood frame. I bought a super-length laundry pole, floor to ceiling, to prop it up where it couldn't fall and kill anyone. Great conversation starter, and in a pinch, I even took it down and slept on it. 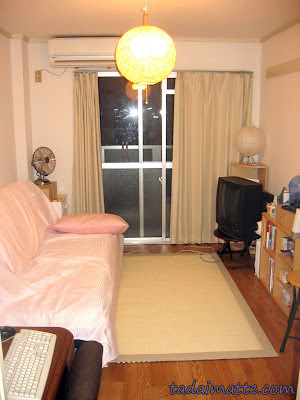 I bought two Japanese-style futons to save space, got my kotatsu in autumn, and inherited four portable tatami squares from a JET who left the following August, working my way up to the "traditional" room I'd wanted when I first planned to go to Japan. I kept a dresser in the oshiire as well as the poles my predecessor had left. At one point I kept the TV in there until it was clear that I was running out of space. I had two sets of plastic drawers in there, as well as my spare futon, the box from my kotatsu (so I could ship it back to Canada one day), and tons of misc clothes and small electronics and cardboardy things. Soon I was storing things on the balcony like a native, though I still didn't think I was doing too badly. After all, I hadn't succumbed and gotten a bed, or a clothes dryer, or a dishwasher or even a chair with legs. I congratulated myself on not buying an adorable legless red loveseat I'd seen at a furniture store in Neyagawa. Even so, my possessions began to stack on top of themselves, and I had run out of storage space. I wasn't psychologically capable of zen living - I hardly even played my SuFami. My book collection doubled, then tripled, then quadrupled, then I stopped counting. Curse you, 100-yen bookstores! When I left Japan, I had a dozen 30-kilo (66-pound) boxes to mail, even after throwing away everything I could bear to part with. For most things, the cost of replacing them here would have been the same or more than the cost of shipping it. But even now I'll suddenly stop and think "Whatever happened to my ____________? Why didn't I take that home? I wish I had taken that home."